Neil Warnock interview: Can the Cardiff boss pull off a miracle? Ahead of his 100th game in charge of Cardiff City, Neil Warnock sat down with Adam Bate to discuss the challenge ahead in a changing game, why he is not worried about being written off, and what it would mean to him to keep the Bluebirds in the Premier League. As Neil Warnock bounds over declaring his love for autumn, he does not look like a man whose team are in the relegation zone and he certainly does not look like someone who is about to turn 70 next month. There was a curry last night - buttered chicken - but he was up early to check the cricket score and is raring to go on this crisp Cardiff morning. "I feel as fit as I have ever been," Warnock tells Sky Sports. "It's difficult to motivate yourself to do the workouts when you get older but I train hard. It's easier to sit at your desk and have a bun, but I've been really disciplined because I feel like I have to give myself a chance. You can't let yourself down on that. You have to be mentally sharp in this Premier League." Three years ago, Warnock was as good as retired but something keeps drawing him back. He took over a seemingly doomed Rotherham side in February 2016 and kept them up - "an amazing achievement" - and then went one better by taking Cardiff into the Premier League in his first full season in charge. It was his eighth promotion and perhaps his best yet. "It has been the best time of my life without a shadow of a doubt," he says. "It has been the hardest but the most rewarding time of my career. It was not in a good place when I took over. There were factions in the club from top to bottom and it has been great to put that jigsaw together. It is lovely to see everyone singing from the same hymn sheet." That's a little unusual given only Fulham's miserable goal difference is keeping Cardiff off the foot of the table. Their 4-2 win over the London side last month is the only one of their last nine matches that has not ended in defeat. But the sense of togetherness prevails, a reflection of the collective awareness the odds are stacked against them. "Everybody thinks we are going to finish bottom, I know that," says Warnock. "But it has always been that way with the bookies. My teams have never been supposed to be able to do the things that they do. Even last year in the Championship we were underdogs. I think that's why the fans keep pinching themselves because they know how far we have come. "I have never had fans like these anywhere, to be honest. The tolerance. The support. It is almost as if they are part of my coaching staff. The majority of the fans know how difficult this will be and are almost treating this season as a bonus because of where we were. But it would be great for the bonus year to become a miracle year. That's the challenge now." It would be great for the bonus year to become a miracle year. He knows it is getting harder. "The improvement in the top five or six is unbelievable over the years," he adds. Not a good sign given Warnock has had four previous seasons in top-flight management with four different clubs. The first two ended in relegation and the last two saw him sacked by early January. No wonder he claims to prefer the Championship. The more likely reason for his ambivalence is that Warnock simply likes winning. "It is always better at the top because if you don't get promoted it's not as much of a disaster as if you get relegated," he explains. "So there is more pressure at the bottom. Also, we are twice the side that we were last year so that just shows how much you have to improve." Pick your Fantasy Football team? 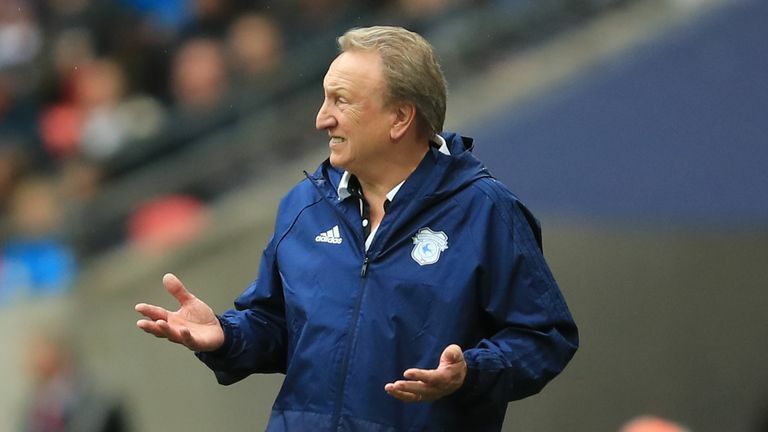 Do any of Neil Warnock's Cardiff players make it into your Sky Sports Fantasy Football side? Still, it is difficult to imagine anyone else coaxing more from these players. "Things change behind the scenes all the time with the technology and the nutrition and I have had to adapt," he adds. "But the art of management has not changed. The art of it is still 80 to 90 per cent man-management. It is just a matter of getting the best out of what you have got. "The Premier League is exciting but it is bloody hard. It is as hard as it has ever been. But all you can do is your best. The positive thing for me is that there is no drop in intensity or desire from my players. There is no feeling sorry for themselves. I look on the training ground and know I cannot get any more out of these lads. It is a great feeling." Is it not a worry too? If these players are giving everything they have got then how can things improve? Warnock believes his team are capable of cutting out some of the errors that have been undermining their efforts and he is already working to bring in a striker or two in January. What's more, Cardiff are not the only team with issues to address. "This season we have lost games because of individuals making silly mistakes," he says. "If we were in the Championship they would still be silly mistakes, the only difference is that in the Premier League you get punished for them. That's the difference. Obviously, if we don't get rid of those mistakes then we are doomed. "But when you look at these other clubs who are in it, they are not used to scrapping around. They feel they shouldn't be there and I think they will find it difficult. I think there are six teams. I won't tell you who the six are but I think there are six in the scrap and I think we have a chance of finishing above three of them. That's how I see it." Whatever happens, he is adamant he will try to enjoy it. He does not have to look too far for a sense of perspective. His wife Sharon was diagnosed with breast cancer in 2015 and the tragic events in Leicester put the matter of mortality firmly in the spotlight when the Foxes were the visitors to the Cardiff City Stadium last weekend. "Last week brought it home," he says. "There is more to life than football. All you can do is give it your best and whatever will be will be." Even so, it still feels fitting that Warnock will celebrate his 70th birthday on the first day of next month in the midst of a particularly hectic Premier League fixture list rather than with his feet up enjoying his retirement. Before all that there is the small matter of Brighton at home live on Sky Sports with Warnock pitting his wits against Chris Hughton - a man he jokingly suggests is giving other managers a bad name by being so nice. A win on Saturday would lift Cardiff clear of the relegation zone. "It is a massive game," he admits. "You can't say it's not really. "But I look at the games from now until Christmas and I feel they are all winnable home and away. We fought to get here and we will fight to stay here. I thought Rotherham was the biggest achievement of my career and then I surpassed it but if we manage to survive it would be the biggest achievement by a country mile. It really would mean everything." And with that the interview is over but Warnock's media duties are not. He proceeds to reel off another 35 minutes for the benefit of the small group of journalists gathered inside the press room at the Vale Resort golf club, holding court on such subjects as Armistice Day, the Prince of Wales' own 70th birthday and the quality of healthcare in Cardiff. Autumn is well and truly here and while that might seem an optimistic seasonal assessment of Warnock's own career, make no mistake, he is enjoying what he calls his bonus season and he is not finished just yet. "I did say I wouldn't bet on us to stay up," he says before pausing for effect. "But I also said I wouldn't have bet on us to get promoted last season."